The development of new health technologies, often based on an innovative use of ICT, has the potential to improve healthcare in general as well as to create economic benefits and growth. Developing this sector is a priority for Luxembourg, and the country is implementing multiple initiatives with this as their objective. The latest one is introducing a health tech track in the successful accelerator programme for innovative start-ups, Fit 4 Start. Launched by the Ministry of the Economy and managed by Luxinnovation, Fit 4 Start offers four months of intensive coaching and pre-seed funding to promising start-ups with a strong drive to succeed. 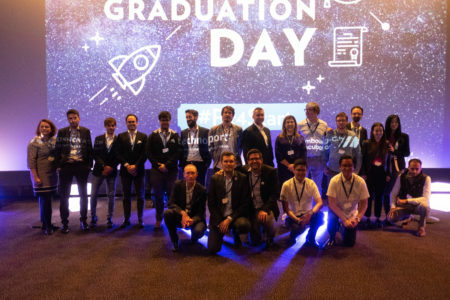 For the autumn 2018 edition, 15 young health tech companies pitched to a jury at the Fit 4 Start Selection & Graduation Day on 4 October. Five of them were rewarded for their innovative ideas and potential with a place in the programme. “Augmented reality (AR) is a new and promising technology that can be applied in a variety of sectors. We use it to bring about a significant change in how surgical data is used and represented in the operating theatre,” says Dr Cédric Spaas, general manager of ARspectra. The company has developed AR glasses that drastically improve fluorescence image-based surgery for various high-incidence cancers by providing direct visual demarcations of tumours. The aim is to significantly enhance the precision, completeness and time efficiency of surgical interventions. “Luxembourg is an ideal launch platform for bringing health tech business to the global level,” says Dr Spaas, who will benefit from the Fit 4 Start coaching to prepare the commercial launch of ARspectra’s technology which, according to him, is “a most innovative new technology in the medical field”. The fifth start-up, Molecular Plasma Group (MPG), has developed a key enabling technology that can “open up new development pathways for the life sciences industry, in fields such as affordable large-scale public health diagnostic programmes and personalised medicine. For example, we are able to graft antibodies onto a glass wafer more than 1,000 times faster than the current solvent-based manufacturing process for in-vitro diagnostic tests while maintain comparable functionality. We expect to show similar performance for a wide range of biomolecules,” explains MPG’s investor and chairman Marc Jacobs. Contrary to the other start-ups, MPG has only recently started to focus on the biomedical sector. “We applied to Fit 4 Start as we lack sector knowledge and really need mentoring in this field. The programme will give us access to experts that can help us build a roadmap for our future development,” Mr Jacobs concludes. For the first time ever, the Fit 4 Start programme was open to start-ups active in human health technologies and a mapping was done of national health tech companies. 2018 was a year with many new activities for the Luxembourg BioHealth Cluster and its new manager. Artificial intelligence, augmented reality, digitalisation... Health is up there with the best when it comes to new technologies. Moreover, with a very dynamic ecosystem, Luxembourg has a lot to say on the subject.